Automatic 3-station carrousel machine with 1 filling tool and 1 drill for the production of disc, cylinder brushes and lag brushes. GIOTTO is designed for high volume production of disc and cylinder brushes, featuring continuous operations along its 3 stations. The first station allows the operator to load the virgin blocks while the machine is drilling and filling them in the other two positions. 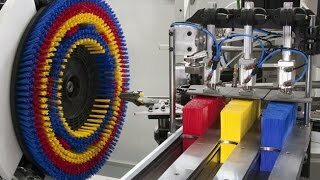 Every time the drilling/filling operation is completed, the machine indexes bringing the brush automatically to the next station. When the working cycle is completed, the brush returns to the first station where a trimmer takes action accurately finishing the brush, which is ready now to be taken off by the o perator and replaced with a new virgin block. GIOTTO is available with standard mechanical filling head or e-STROKE filling head. The e-STROKE version allows to adjust the stroke of the machine at a variety of speeds, maximizing production speed (RPM) based upon fiber length in the brush. Incorporated computer controlled trimming unit. Fiber feeding system: stock box for synthetic filament up to 3 colors. Automatic fiber feeding system (optional).